Jane Hughes is a native North Carolinian who has decided to put down roots in Northern Virginia. She graduated from Florida State University with a BME and MME, and enjoyed a successful career as an elementary music teacher. 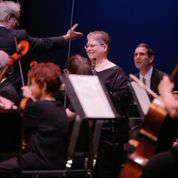 Music remains a passion; Jane is currently working for a local defense contractor by day and performing in musical ensembles in her non-work hours.